Most people probably know of Moussaka as a "classic" Greek dish, but Vegetarian Moussaka is not quite as well-known. 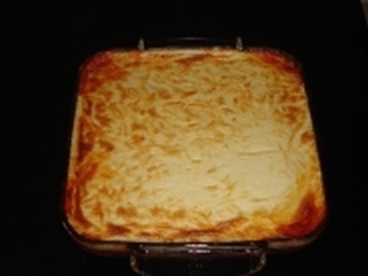 We find it really delicious and many people who are not vegetarian have said that they actually prefer it to the "normal" moussaka, which is made with meat and not mushrooms. Try it and I'm sure you'll like it! Slice the potatoes, courgettes and eggplants lengthwise into ½cm slices. Deep fry them – first the potatoes, then add the eggplants and finally add the courgettes. Remove them and place them on absorbent kitchen paper to drain off as much oil as possible. Gently fry the onions in a large pan. Add the crushed garlic and stir for 1 minute. Add the mushrooms and continue stirring. Add the tomatoes and bay leaves. Continue heating until all the juice has been absorbed and you have a thick sauce. In a heavy-bottomed pan gently heat the butter until it melts. Add the flour and stir continuously. Add half of the milk and continue to stir with a whisk. When the mixture starts to thicken, add the rest of the milk whilst stirring continuously. When it starts to thicken again, lower the temperature to the minimum and add the grated cheese and then turn off. In a deep oven dish place a layer with half of the potatoes at the bottom. Add a layer with half the eggplants on top and then a layer with half the courgettes. Spread the sauce on top. Add a layer with the remaining courgettes on top of the sauce. Add another layer with the remaining eggplants on top and finally a layer with the remaining potatoes. Add the béchamel on top and sprinkle the remaining cheese over it. Bake in a pre-heated moderate oven for approx. 40 minutes or until it has turned a golden colour on top. If you've tried this recipe, please rate it! Thanks for this great recipe! Can you please adjust the fonts? It gets smaller and smaller! Hard to read! cheers! bokjae - I've adjusted the font. For earlier posts I was using a smaller font, which obviously was too small. I hope you enjoy it! Great recipe and easily laid out. Good site for real greek recipes, and will bedownloading your kindle edition. What oven temperature is this meant to be baked at? The oven temperature is moderate - 180 degrees Celsius. How many people would you say this feeds? This should comfortably feed 6. This look good! I don't do a lot of cooking, and I have a few questions. Can you tell me what size tin of tomatoes you use? Also, can you give me an idea - in length or weight - what constitutes "medium" and "large" for the veggies? This seems like a huge amount of food - what size dish do you cook it in? I should imagine it would be a standard size can. We have 14oz cans here. Also, as a new cook, try to follow the "medium" or "large" size by what you see at the market. Most of these vegetables will wilt down as your cook them so expect that shrinkage. I should think a 9x13 inch pan would work. Thoroughly enjoyed it. Didn't put the potatoes on top I felt it would be too much.thanks for a great recipe. This is sensational....just one thing I di which may help others is after u slice the eggplants salt them & allow to drain in a colander for 30 mins. This takes a lot of the excess moisture out of the EP so they don't go mushy. Wash the salt off of the EP & dry with kitchen paper, the proceed with the great recipe. Thanks for the great feast we had with this meal. Thanks for that tip, Kezz1812! So glad you enjoyed it - it's one of our absolute favourite recipes! This sounds great, have copied it to try this week. I wonder though if instead of deep frying they could be blanched and then lightly fried in olive oil? Just to cut down on calories :) I read one recipe years ago where someone used farina in mashed potatoes for the topping layer? But that just had eggplant and lamb layers I believe. Have enjoyed your blog very much now that I've found it. Going to try this week but will saute the veggies then lightly fry them I think. Love your blog and so happy that I found a place with REAL Greek recipes.